Anybody who follows the real estate market knows that the National Association of REALTORS® (NAR) recently announced that they had been over-stating sales (oops) since 2007. Some people were quick to point out that this announcement means the housing market is doing worse than previously thought, but there might be another reason for this well-timed announcement from NAR. 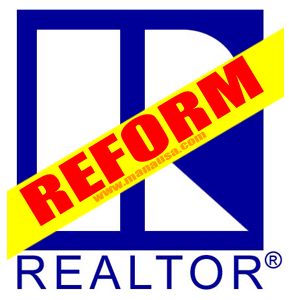 Could it be that NAR sees this as a way to avoid reporting a new market bottom? You see, if we can make the past look worse, won't that make the present look better? This is not as far-fetched of an idea as you might think. Hmmm. So let's see. Things are getting better now (after a minor adjustment to our past history). Does NAR really think that they are gaining any credibility with this latest campaign? A better announcement would be an acknowledgement of broken systems, how they plan on modernizing their data collection and reporting techniques, and some obviously overdue staff changes. Unlike NAR, we do not make estimates of the housing market, we actually report on home sales directly from either the Tallahassee MLS, or the Leon County Property Appraiser. The MLS data is useful when comparing supply and demand (the MLS only represents a portion of all home sales in Tallahassee), while the property appraiser data is very useful when doing historical analysis of the entire Tallahassee real estate market. 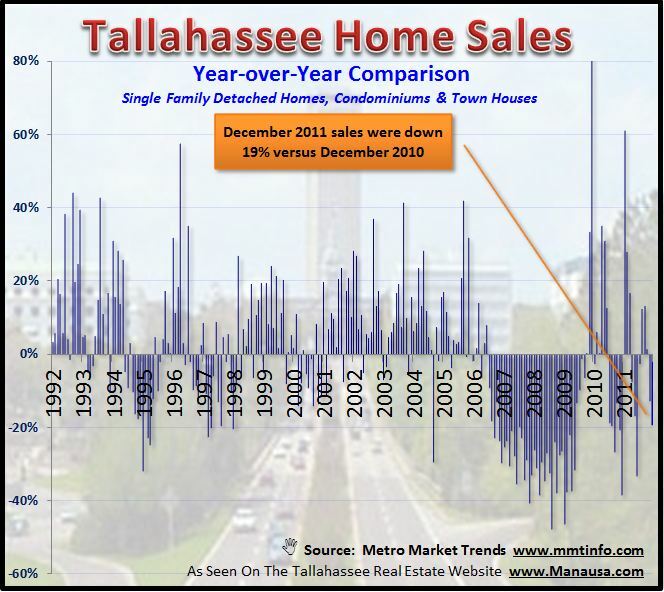 The following graph shows that for the second month in a row, year over year home sales fell 19% in Tallahassee. This means that home sales in December were 19% lower than they were during December 2010. When we look at the real estate graph above, we see this is two consecutive months of declines, which resulted in 2011 being the worst year for home sales in Tallahassee for at least the past 21 years. This next graph shows daily closed home sales trends from both of our data sets. The dark green area shows all recorded home sales in Tallahassee, while the light green area shows the portion of the market that is recorded in the Tallahassee MLS. So unlike our NAR reporters, we will acknowledge the severity of the housing crisis. There is a new bottom in the Tallahassee housing market, and most other markets across the US. There are a lot of people who want to move, but they owe more on their home than it is worth. They need a solution to being trapped in a home, and right now, there are limited options for most people. The National Association of REALTORS should be the voice for US home ownership. This does not mean they should lie about the state of the housing market, rather they should be lobbying for improvements by reporting the facts. Outdated NAR systems must go. 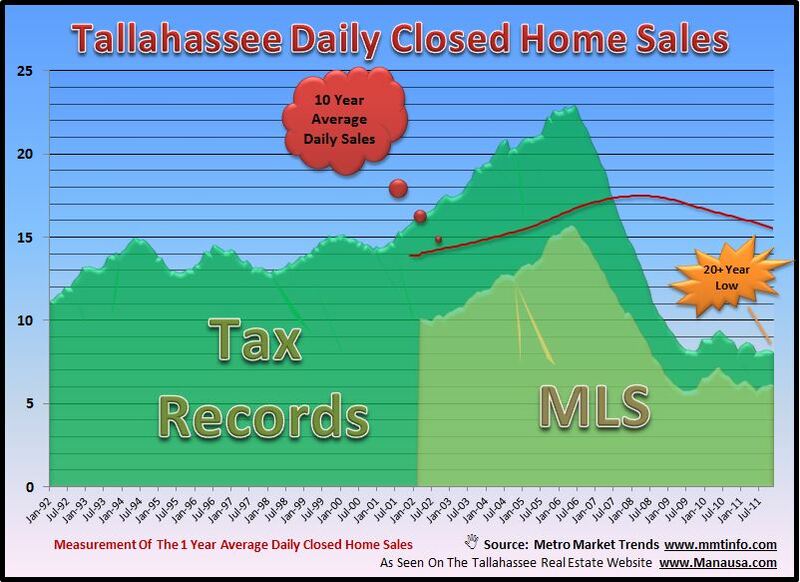 In the graph above, we are able to see 100% of homes sold in Tallahassee. We did not estimate this with an algorithm written in the 1960s, instead we used available data on all recorded home sales. NAR could do this for the entire country. But NAR uses some (not all) MLS data (the light green in the graph above) to report on the national housing market. It just doesn't make sense in this day and age when real, accurate information is available. But until they change, you can always visit the Tallahassee Real Estate Blog for timely, accurate charts, graphs and analysis of the Tallahassee real estate market. And if you are thinking about selling a home, I am here to help, even if your home is not located in our market area. Every month we help people by linking them with the best real estate organization in their area, where they can get the honest, accurate, and timely help they need. Whether you are in Tallahassee or elsewhere, just drop me a note (<- By clicking this link) and I will help you get the assistance you need. Great article! Linked in sent me your article in a group with a few other real estate posts. I had to click through to actually read it. I was very impressed. The Bryan College Station market is not going through what your market is experiencing. We are actually holding our own pretty well while our particular office is gaining market share. Hope NAR will listen and report REAL info! That's great Susan. I know some parts of the country are hanging tough ... we like to hear the positive news and know our day is coming.